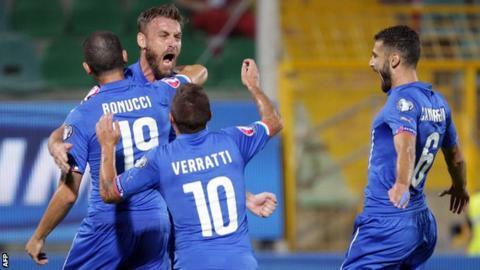 Italy moved two points clear at the top of Group H as Daniele De Rossi hit the winner before being sent off against Bulgaria in a Euro 2016 qualifier. Roma midfielder De Rossi, 32, scored from the penalty spot after Veselin Minev tripped Antonio Candreva. Both teams finished with 10 men, De Rossi sent off with Bulgaria's Iliyan Mitsanski after the pair clashed. Italy goalkeeper Gianluigi Buffon, 37, won his 150th cap in the victory but he was rarely tested. Norway are two points behind Italy in second place after a 2-0 win over Croatia in Oslo. With two games remaining, two of Italy, Norway and Croatia - third in the table with 15 points - can still secure automatic qualification. Italy entertain Norway in their last game in Rome on 13 October. In the group's other game, Azerbaijan drew 2-2 at bottom club Malta. Match ends, Italy 1, Bulgaria 0. Second Half ends, Italy 1, Bulgaria 0. Marco Parolo (Italy) wins a free kick in the defensive half. Foul by Dimitar Rangelov (Bulgaria). Corner, Bulgaria. Conceded by Gianluigi Buffon. Attempt saved. Georgi Milanov (Bulgaria) left footed shot from outside the box is saved in the top centre of the goal. Assisted by Mihail Aleksandrov. Attempt blocked. Éder (Italy) right footed shot from the centre of the box is blocked. Assisted by Giorgio Chiellini. Attempt missed. Leonardo Bonucci (Italy) header from very close range is too high. Assisted by Alessandro Florenzi with a cross following a set piece situation. Éder (Italy) wins a free kick on the left wing. Foul by Ivan Bandalovski (Bulgaria). Substitution, Italy. Éder replaces Antonio Candreva. Svetoslav Dyakov (Bulgaria) is shown the yellow card. Foul by Svetoslav Dyakov (Bulgaria). Offside, Italy. Marco Verratti tries a through ball, but Simone Zaza is caught offside. Leonardo Bonucci (Italy) wins a free kick in the defensive half. Foul by Simone Zaza (Italy). Nikolay Bodurov (Bulgaria) wins a free kick in the defensive half. Dimitar Rangelov (Bulgaria) is shown the yellow card for a bad foul. Alessandro Florenzi (Italy) wins a free kick in the attacking half. Mihail Aleksandrov (Bulgaria) wins a free kick in the defensive half. Simone Zaza (Italy) wins a free kick in the defensive half. Foul by Mihail Aleksandrov (Bulgaria). Substitution, Italy. Alessandro Florenzi replaces Stephan El Shaarawy. Substitution, Italy. Simone Zaza replaces Graziano Pellè. Substitution, Bulgaria. Dimitar Rangelov replaces Ivelin Popov. Dangerous play by Georgi Milanov (Bulgaria). Foul by Leonardo Bonucci (Italy). Matteo Darmian (Italy) wins a free kick in the defensive half. Foul by Veselin Minev (Bulgaria). Substitution, Bulgaria. Mihail Aleksandrov replaces Todor Nedelev.